Retargeting converts window-shoppers into buyers. Popular findings show that only 2% of the web traffic converts in business. On their first visit, a large chunk of visitors leave your website without any transactions. You can retain your valuable customers since you do not want your investment and effort to go in vain. This can be done by reminding the customers about your services and products who have already shown interest in them. Our Ad Re-targeting will follow your customers wherever they go. It will remind them that they have not yet bought products and services from your store / website. Ad-Retargeting, also called Ad re-marketing, is a process wherein your ads are displayed to those visitors who recently visited your website but didn’t purchase anything. This process is carried out via different ad networks. With the help of online Ad-Retargeting, you can capitalize and target those visitors who have shown interest in the services and solutions offered. This will help in boosting visitor traffic and increasing the click rate. 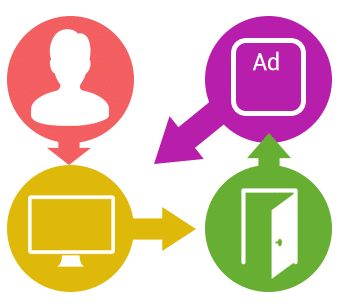 The working of Ad-retargeting can be better explained with an example. When a person visits a website, a small snippet code placed on each page of the website monitors the individual pages visited by him/her. Cookies will get installed in the browser of the visitor. When the visitor leaves the given page and migrates to other pages, the ad words of that website are displayed on the website that the visitor next visits and so on. This can be carried out easily, if the succession of websites that the person visits are within the ad network. The idea behind ad-retargeting is to keep reminding the visitor about the products and services he took interest in previously. How Do We Perform Ad Re-Targeting? Our team of experts help you to recover the lost sales by working round the clock the clock to create highly persuasive yet professional ads. This helps in putting your brand in the forefront so as to influence the target audience to make a solid purchasing decision. In this method of retargeting, the potential as well as existing customers are targeted with display ads across their favorite websites, blogs and such other sites to bring them back to your website. Web retargeting is a great way to convert the prospective buyers into your customers. It is not surprising that most of your customers spend a lot of time on Facebook in recent times. So, it is highly beneficial to spend time retargeting your prospective as well as existing customers on Facebook. We can help you with targeted Right Hand Side ads and native ads in Facebook News Feed on both desktop as well as mobile. Modern consumers are more prone to buying anything and everything on their mobile device. It is possible to retarget desktop site visitors on their mobile device when they are browsing social networks and similar other websites on a mobile device. Also, the mobile site visitors can be retargeted while they browse other websites on the mobile itself.